Snow White and the Seven Dwarfs, a summer musical production for youth. The Current 2018 Production for children involves varying rates for different levels of participation. Scholarships available. Professional young actors will be compensated accordingly. RiverArts Productions is a pre-professional and performance based program for young adults. Our 2018 Current Production is Snow White and the Seven Dwarfs. Students will develop a professional approach to vocal delivery, characterization, singing, dancing, and stage combat. The summer production presents the perfect opportunity for young actors of all cultural backgrounds to hone their skills and develop a resume. Whether a casual enthusiast or an aspiring professional, all are welcome to attend. Boys and Girls ages 7 -12, diminutive and funny, each possessing a certain stock character personality, the clowns and comic relief of the play. Small, wiry and blond, very agile athletic and playful. A madrigal, he plays guitar and sings. A sharp-tongued spitfire, little and crafty, skilled with a crossbow. 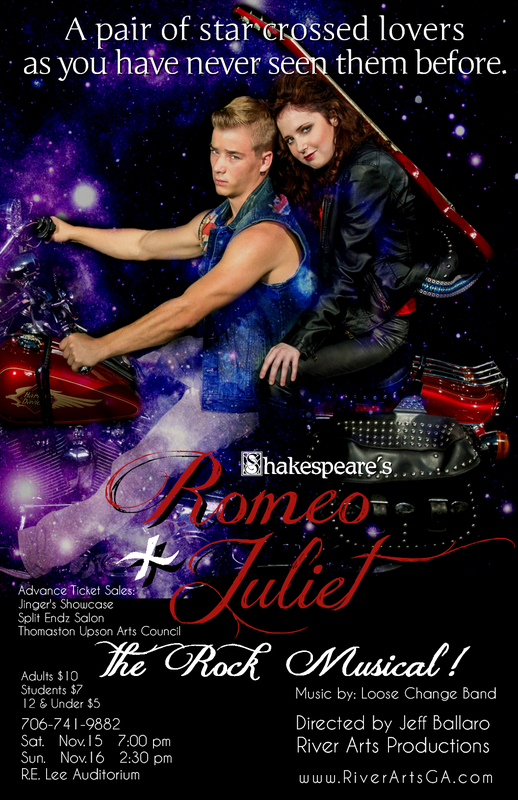 RiverArts Productions | Presents Romeo + Juliet, the Rock Musical! Please click on an image to scroll through photo gallery. Click here for more images from the Romeo+Juliet production. Auditions for Romeo + Juliet, the Rock Concert! River Arts Productions, a newly founded drama troupe and talent agency in Middle Georgia dedicated to providing opportunities for young performers in stage, television, and film, announces auditions for its upcoming production of Romeo + Juliet, the Rock Concert! Experience Shakespeare’s classic play in an updated and exciting new way. Actors, singers, and dancers in all age categories will be needed for this workshop production. Main characters will be cast out of high school, college, and middle school students. Singers and dancers in the elementary grades will be utilized greatly in the chorus. Singers please bring sheet music or an accompaniment disk. Auditions will take place at Park Lane Play Place and Fine Arts Center, 202 Park Lane, Thomaston, GA on Monday September 8th and Tuesday, September 9th from 6pm-9pm. Details about the workshop and directions to the facility are available by clicking here for Map. Otherwise contact us at 706.741.9882. 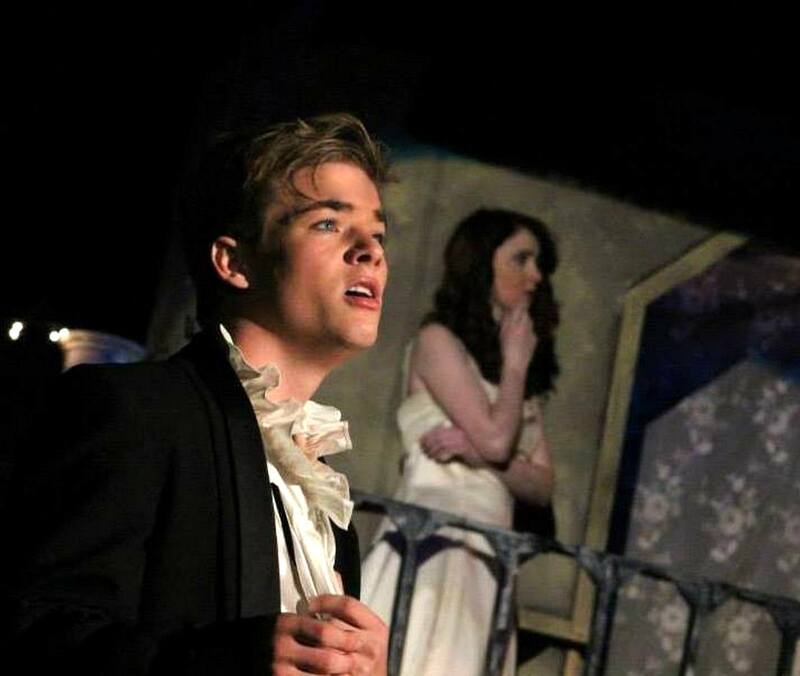 Romeo + Juliet, the Rock Concert! You are invited to Sign Up today! 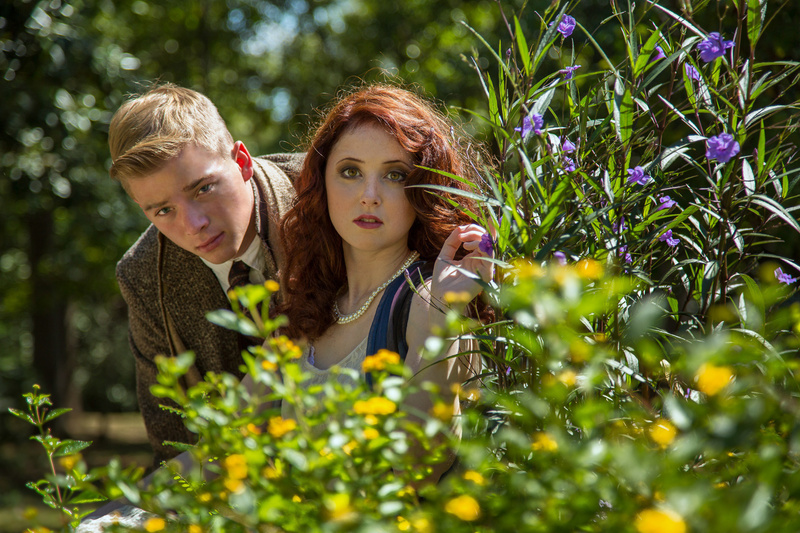 This Workshop Production prepares the student to participate in River Arts Production’s upcoming full length musical production of Shakespeare’s Romeo and Juliet. 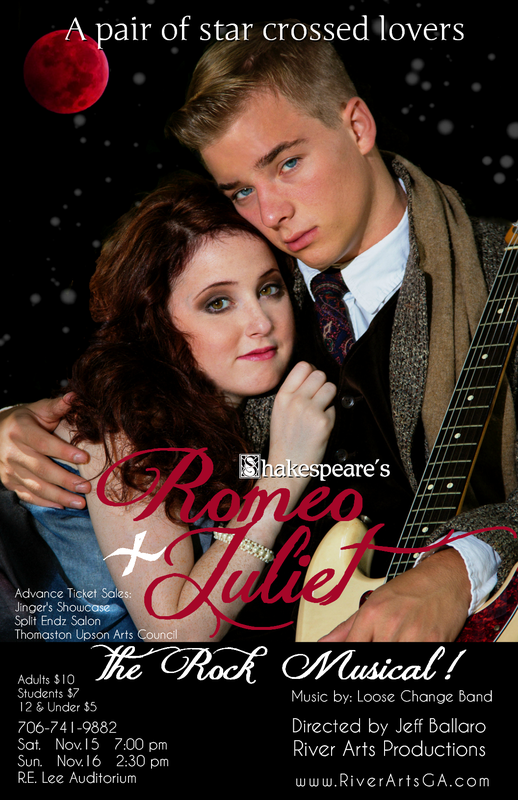 River Arts Productions| Auditions for Romeo + Juliet, the Rock Concert! Auditions will take place at Park Lane Play Place and Fine Arts Center, 202 Park Lane, Thomaston, GA on Monday September 8th and Tuesday, September 9th from 6pm-9pm. Details about the workshop and directions to the facility are available by clicking here for Map. Otherwise contact us at 706.741.9882. This Workshop Production prepares the student to participate in River Arts Productions’ upcoming full length musical production of Shakespeare’s Romeo + Juliet, the Rock Concert.